The Toronto Maple Leafs visited Dallas on Thursday, looking for their seventh straight win. Everything has gone their way of late. That is cruel and unusual. This might be more embarrassing than the John Ferguson Jr. era. Bieber, we remind you, was arrested in Miami Beach and charged with driving under the influence and resisting arrest. That above photo is his adorable mugshot. The Stars have developed a real chip on their shoulder of late. In June, they won the #ImGregoryCampbell hashtag by burning Sean Avery hard. Last January, they trolled the Dallas Cowboys, tweeting a photo of Mike Modano hoisting the Stanley Cup along with the phrase, "At least our #9 got the job done." And this is hardly the first time the Stars have incorporated the Jumbtron in their trolling. A week after zinging the Cowboys, when the Manti Te'o cat fishing scandal broke, they claimed to have spotted the football star's girlfriend on the Jumbotron. It was, of course, an empty seat. You guys are jerks, Dallas. And we love it. Toronto did not. 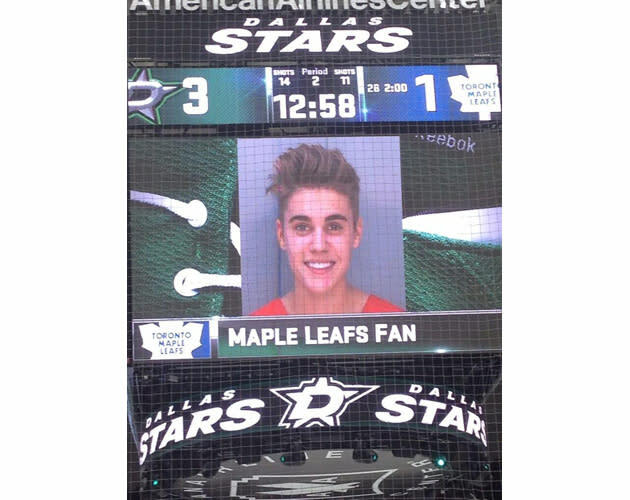 Obviously rattled by the reminder that Bieber is among their supporters, they lost 7-1.